100 years ago today, on October 4, 1918, Victor Earl Garrett died near Exermont, France. He was only 24. 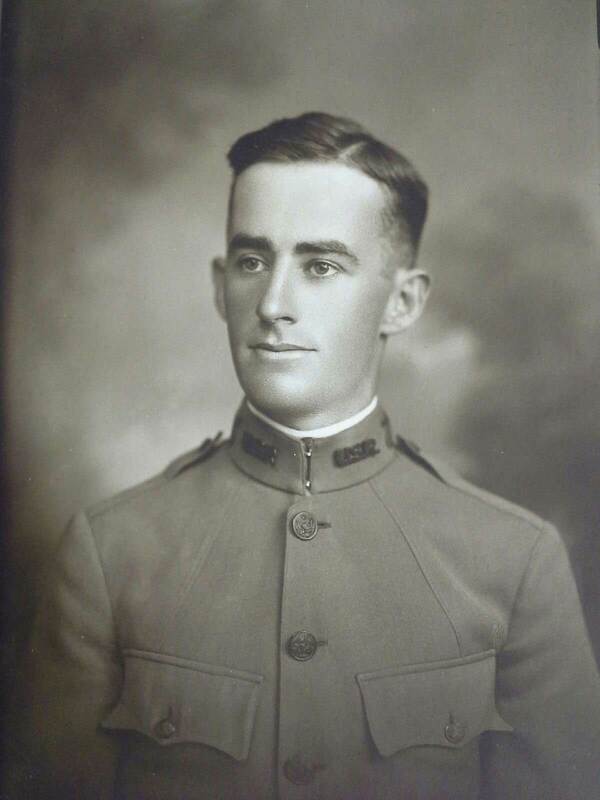 Garrett was a 2nd Lieutenant, a member of the 28th Infantry Regiment, 1st Infantry Division, U. S. Army, and died during the Meuse-Argonne Offensive. For many people, Earl Garrett is just the name of a street in downtown Kerrville. But he was a brave young man who volunteered to fight for his country, a member of a prominent local family, a family who mourned his death for the rest of their lives. I've written elsewhere about Sidney Baker and Francisco Lemos, the other two heroes of World War I who are memorialized with a street name in Kerrville. Like Garrett, both Lemos and Baker died in battle. Lt. Garrett was killed in action while leading an attack of five men on 30 entrenched German soldiers; his four fellows survived the attack, and managed to take 20 German prisoners. For his heroism that day, and for an incident the previous July, Garrett was posthumously awarded the Distinguished Service Cross. On July 19, 1918, during the fighting near Soissons, Garrett supervised the care of his wounded men with disregard for his own safety. And on his last day, despite having an injured foot, he refused to be sent back to safety, and led the attack on the German soldiers. He was a student at the University of Texas at Austin when war was declared, and, according to the Daily Texan of November 19, 1919, "he was among the first students to leave school in the spring of 1917 for the training camp at Leon Springs." Garrett's name was among the 88 names read at the University on November 14, 1919, when the campus honored its war dead. "It is given to some to impress others by some striking gift or to fall through some great weakness or misfortune but rarely does one make a profound impression simply by what he is; that, I think, was the supreme distinction of Earl Garrett. "Quiet, gentle and unassuming as a child, a youth and as a man, yet he was in all crowned with the spontaneous love and respect of all who knew him. In his Christian life he was modest and unpretentious, yet so sincere and constant as to command the admiring comment of fellow students and soldiers. "Loving the life of a student and a dreamer, the call of duty and loyalty to the highest ideals of a citizen and Christian proved him a man of the clearest convictions and of a courage which did not falter at any danger of hardship nor hesitate to give life itself, that truth might live." Several months ago Bob Schmerbeck, who is related to Earl Garrett, loaned me a notebook of letters Garrett's family gathered after his death. The packet included letters to Earl Garrett, letters from him, and letters from others about him, including from those who were with him when he died. One month before he died, Earl Garrett wrote his mother, Laura Gill Garrett, a touching letter. "My dearest Mother, it will probably be only a note, but I wanted to write you tonight. It may be some time before I can write you again and I do not want to neglect this opportunity. "Mother, it is a long cry from here to home, but never so close as tonight. And never have I been so conscious of what you have done for me or felt so unworthy of your efforts. I could not write a sad letter even if I wanted to; my temperamental make up would not let me. But I do want you to know before anything might happen that I at least appreciate my mother and my father. "I am habitually optimistic -- of the incurable type, less a considerable portion of confidence in my ability. But the great possibility cannot be ignored. "With love to all, your son, Earl." That was the person for whom a street was named in Kerrville. Victor Earl Garrett was a young man, a dreamer, who felt called to duty, who was brave to the end. He is buried in France, at the Meuse-Argonne American Cemetery and Memorial. Sidney Baker is also buried there. Joe Herring Jr. is a Kerrville native who finds some columns harder to write than others.